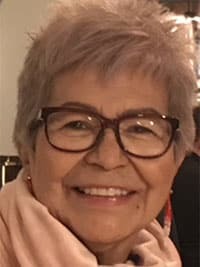 Beulah Faye Langford - Edmonton's Burial & Cremation Professionals | Trinity Funeral Home Ltd.
Lola, passed away peacefully at home with her family by her side. She was predeceased by her parents Fred and Patricia McKay, her brothers Donald McKay, Stanford (Jimsy) Alexson, one sister Valerie Alexson. She is survived by her loving husband Donald of 55 years, her daughter Patricia, her sons Donald (Rhonda) and David (Jennifer), 10 grandchildren, Caleb, Rebecca, Jillian, Jolene, Jordan, Jada, Chevy, Cheyenne, Cheyna, Chase, 5 sisters Cindy (Tom), Maureen, Charlotte, Geraldine, Marilyn, and one brother Freddy and numerous nieces, nephews and extended family. Lola has requested that in lieu of flowers, donations be made in her name to the Edmonton SPCA.